you'll find the upside-down town of Nottingswood. to let their town decay into a colorless wasteland. 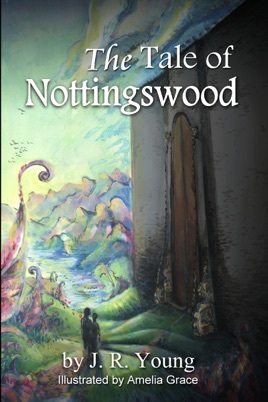 The Tale of Nottingswood, by J. R. Young, with illustrations by Amelia Grace, is a fictional novelette written entirely in verse, but formatted in prose for easy reading. Nottingswood is an exciting and dramatic story perfect for the whole family to enjoy. Whether read aloud together--with each person playing a part--or read quietly curled up on the couch, The Tale of Nottingswood excites both the heart and the mind. The book is rated at a 7th/8th grade reading level, and, much like Harry Potter and other popular juvenile fiction, the story is as delicate and deep for the adults as it is for the kids.